Tom Ford TF0248 Henry - Dark Havana Need Help? The latest installment of the blockbuster James Bond franchise 'Spectre' hit theatres, and while some might take special notice of the cars, clothes, or gadgets, here at Eyegoodies we are all about the sunglasses. So we couldn't help but spot the world's favorite secret agent, played by Daniel Craig, wearing the Tom Ford Henry sunglasses. Worn by Bond extensively throughout the North African Scenes, the Henry sunglass is a classic clubmaster shape with subtle Tom Ford detailing. Handmade in Italy of rich dark havana acetate paired with gunmetal accents and finished with "smoke" colored lenses. 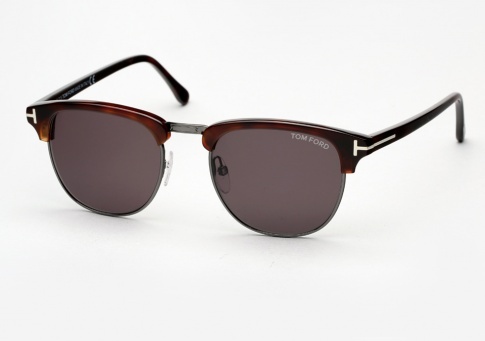 Also be sure to checkout the other frame worn in the film: Tom Ford Snowdon custom.